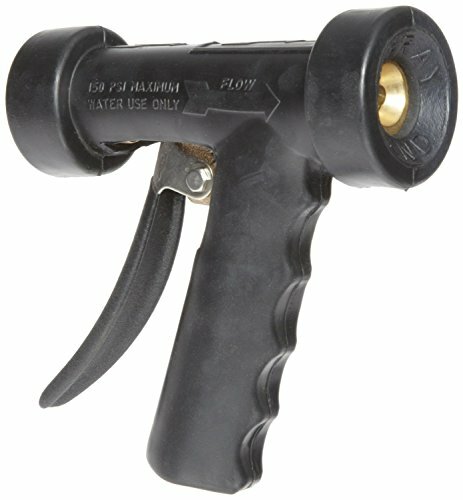 This Dixon BWSG nozzle is a hot water washdown spray nozzle with a pistol-style grip. It has a 1/2" National Pipe Thread (NPT) female inlet at the bottom of the gun for attaching to a hose. It is made of brass for corrosion resistance, ductility at high temperatures, and low magnetic permeability. The nozzle is rubber coated to protect from high temperatures and the rear-mounted lever reduces hand fatigue. It is adjustable for variable spray patterns, from a solid stream to a 50-degree hollow cone. It has a maximum pressure rating of 150 pounds per square inch (psi) and a maximum flow rate of 12.5 gallons per minute (gpm). This hot water washdown spray nozzle is suitable for use in low-pressure cleaning and sanitation applications, such as food and dairy processing, tank and drum cleaning, pharmaceutical and chemical manufacturing, and meat and poultry packing. It is not to be used with steam lines.